Spring is just around the corner and that means Spring Training for baseball is right around the corner. 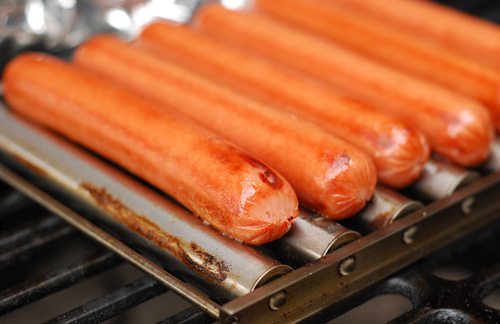 And that makes me think of hot dogs because baseball and hot dogs have been paired since the end of the 1800's. Knoxville does not have a Major League Baseball team in our market but we do have the Tennessee Smokies, a Chicago Cubs minor league affiliate. They play at Smokies Park in Sevierville, which is in the foothills of the Great Smoky Mountains. The local college baseball team is the University of Tennessee Volunteers whose mascot is Smokey, a bluetick coonhound. Confused yet? Don't be. We just like to keep changing the spelling of Smokie, Smoky, and Smokey in East Tennessee. It is served hot and fresh. Not luke warm, crammed into aluminum foil. It is an entire meal on a bun. We don't need no stinkin' side dishes. It is based on regional influences and preferences. Here's what I came up with. 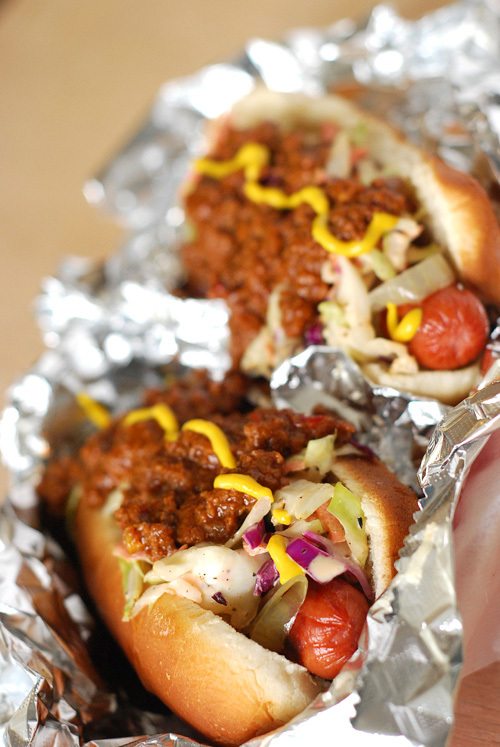 The regional "dog" for East Tennessee, North Carolina, and a lot of the South is an "all the way dog" with slaw, chili, diced white onion, and yellow mustard. To play along with the Smoky theme, I decided to do a grilled coleslaw and caramelize the onions on the grill. Messy but delicious! And look...SMOKY. No, I didn't throw a bowl of slaw on a hot grill, I just grilled the cabbage used for the slaw. This is a tip that I picked up from Chris Lilly at Kingsford University last year. Grilled Veggies - grill the individual components used in making a vegetable dish. He made a ratatouille that way. Preheat a charcoal grill set up for direct heat to 400-425f. Today I was using my Smoke Hollow grill and used 6 quarts of Kingsford™ briquettes. The quantity will vary by the size of the grill that you are using. 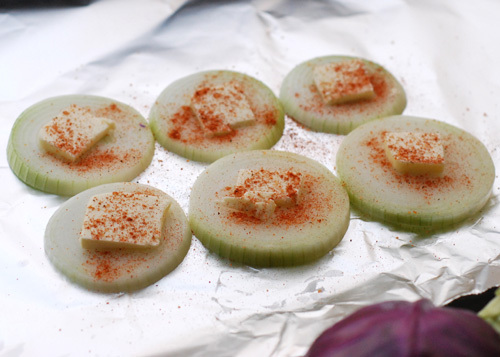 Place onion slices on a sheet of heavy duty aluminum foil. Top each with about 1 teaspoon of butter and season with the BBQ rub. Fold edges of foil over and seal to make an envelop. Mix together the coleslaw dressing and refrigerate. Place the foil packet on the grill along with your pot with the chili. You will cook both for the whole time, about 20-25 minutes. Flip the foil packet half way through. Do NOT flip the chili pot. Makes one heck of a mess if you do. Meanwhile, lightly brush the cut sides of the cabbage with olive oil and grill 3-4 minutes per side, just long enough to get a light char. Remove and allow to cool. 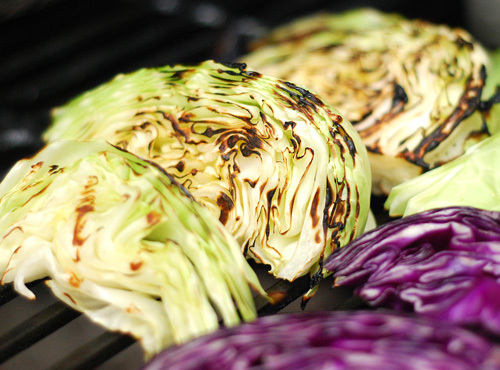 Slice across the cabbage wedges into very thin slices (think matchstick width) and place in a large bowl. * Add the carrot, onion and coleslaw dressing. Toss to coat thoroughly. Place in the fridge. 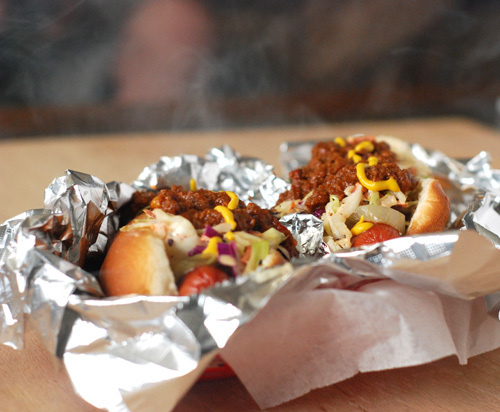 Grill the hot dogs to your preferred degree of char. I like just a little and went about 6 minutes, rotating often. 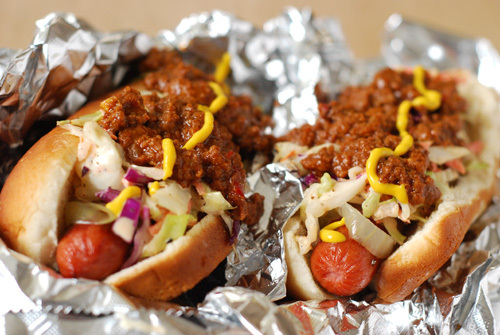 Remove everything from the grill and assemble in this order: bun, dog, onions, slaw, chili, mustard. Wipe your face....were you raised in a barn? Use your favorite BBQ rub. You can just use salt and pepper, but I like the "zing" that a BBQ dry rub brings. You can make your own, I like to use Meathead's All Purpose Chili Sauce recipe. But today I cheated and used Lays Market Chili Con Carne. They are a local company and we know the family personally. It's available at Food City stores. Coleslaw Tip: Always use a flat bottomed bowl. As the slaw sits, the dressing will drip to the "bottom". The wide bottom will keep more of the veggies in the dressing. 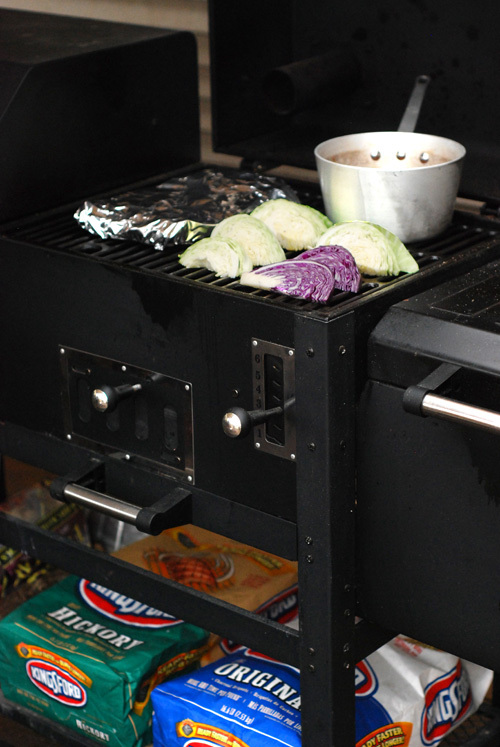 "hobo packs" are a great way to cook veggies on the grill. 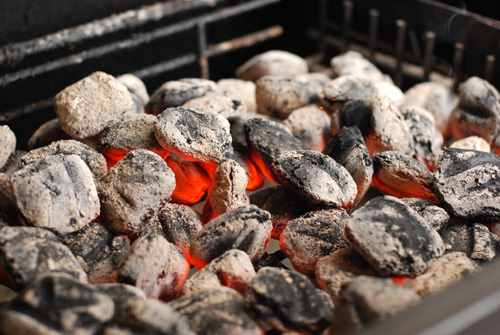 I never get tired of seeing the red glow of coals. I used my Smoke Hollow combo grill/smoker today. Grill just long enough to get a light char on the edges. It really boosts the flavor of the slaw. The rollers are completely unnecessary. But does make grilled dogs so easy.